Offering you a complete choice of products which include transparent ac curtains. We are offering PVC Transparent Curtains. These curtains can be used to save Dust & AC cooling in rooms, shops & in industireis. 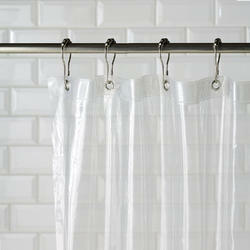 These are available in sizes like 137cm * 213sm, 137cm* 243cm, 137cm * 273cm, 137cm * 303cm and can easily fit shower rail. These curtains Are available in many thickness too starting from 0.10mm to 2.00mm. These Manufactured from 100% PVC base material, our curtain is fully waterproof and can be hung with 8/12 einforced eyelets. Can make cutomized sizes required too as per our buyer requirements.